Blue symbols indicate there are new/unread comments in that discussion. Grey symbols mean that there are no unread comments. Carver, Lecture questions, and Week 3 Reading are currently available. Carver is attached to the Short Stories in the 1980's lesson. Annie Dillard is not yet available. Week 1 Reading and Writers and Maturation have been closed for comments; you may still view those discussions but not contribute more to them. Week 3 Reading and Annie Dillard are Graded Discussions, which means that you will receive a grade based on your participation in the discussion (see below). In graded discussions, your instructor may set up grading criteria. Requirements help the instructor evaluate your participation in the discussion. You'll see the requirements in the right column of the discussion page, together with a running tally of how you're doing with each requirement. If you're enrolled in or auditing a course and the instructor has permitted students to do so, you can start a discussion. Go to the main Discussions view. Give the discussion a title and a topic—you'll need to enter both in order to create the discussion. Attach a file if you like (that's optional). Your instructor has options to link your discussion to a lesson, change it to a graded discussion, and close it. Scroll to the bottom of the discussion. Enter your comment in the text area and click Add Comment. Likewise, to post a new reply, find the comment you wish to reply to. Click Reply and enter your text. You can use text formatting in comments and replies. Sometimes your instructor will require that you first post a comment before you can see anyone else's comments. 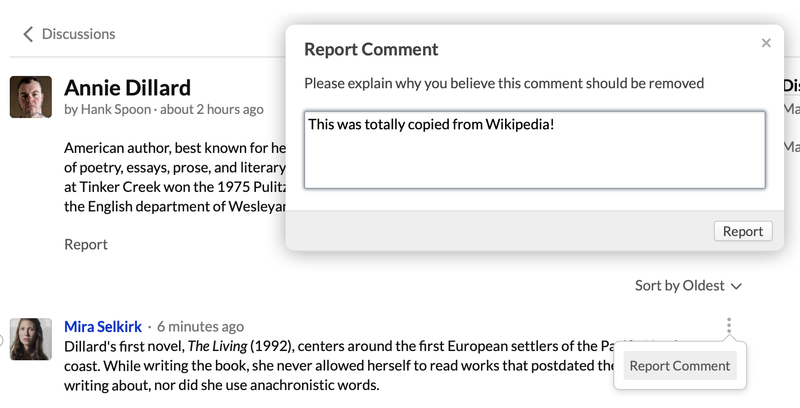 If your instructor has enabled Peer Rating for comments and replies, you can rate comments from your classmates—just click the number of stars you'd like to award that item. If another student posts an inappropriate comment or reply, you can report that item to the course instructor. Click Report under the item and enter your explanation. Your report will be sent to the instructor (with your name attached) for his consideration. I believe I will understand further once I actually utilize it, yet this is useful to have at a click away. Ok after many obstacles my son finally got me into the online operations. Now I need to learn how to move around the system using a PC, because my Mac has taken a time out (stopped working). Ive been truly stressed about the whole online schooling experience, and so far it's been a rough road. Keep me in prayer and I'll do the same for you. Many Blessing coming your way. I admire the "Post First" feature. Way to go, Populi! Thank you!! This was great!